The Kenmore Elite White 4.5 cu. ft. Front-Load Washing Machine (4051) ENERGY STAR® is not just concerned about cleaning clothes though that is a primary focus. It is also bent on conserving energy and other resources used during each cycle. Adding to the mix of clean clothes and energy conservation is fabric care, which should also be a priority. 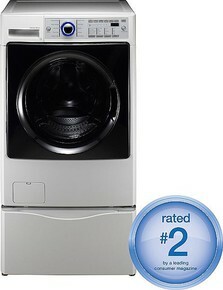 The Kenmore Elite White 4051 model is Energy Star qualified. Its Sanitize Cycle enables it to kill 99.9% of bacteria, making it NSF certified. The washing machine boasts of a Kid’s Wear cycle that allows it to gently but effectively wash the clothes of tiny tots. It makes use of the four motions of Smart Wash Technology: Stepping, scrubbing, rolling and tumbling. It spins at a maximum speed of 1200 rpm. It has several standard and special cycles. Standard cycles include normal, heavy duty, whites and delicate. Special cycles include steam, express wash, unique, sanitary and large items. During each cycle, the user can choose to pre-wash, treat stains or delay the cycle. A cycle can be delayed for up to 19 hours. Through the Vibration Guard Technology, it operates quietly. Users can pause mid-cycle to add a garment. The top and lid are made of painted steel. The washing machine is stackable with its matching dryer. It has electronic controls, with blue LED. The washing machine has dispensers for fabric softener, detergent, bleach and prewash detergent. This Kenmore model makes good use of the latest technology. It operates quietly but efficiently, saving not just money and energy but also the quality of clothes. Being NSF certified, the washing machine also effectively removes most of the bacteria on the laundry. The machine can also accommodate small children’s clothes. The machine can do a lot of things out of a minimum amount of water and detergent. Consumers love it. There is not much to say in the negative department regarding this particular Kenmore model. However, its height could be a factor in some small rooms. The plain white overall color may also not be the most attractive addition to any room.